Every kid thinks he's different. Some of them are. Once he was Otto Octavius - a brilliant but introverted young scientist who built a set of highly advanced robotic arms to help him further the field of atomic research. But a freak laboratory accident grafted the mechanical tentacles to his body and altered Octavius' mind: Abandoning his scientific dreams, he turned instead to a life of crime! Now, peer behind the curtain to witness the birth of a mad genius! Featuring Doctor Octopus' first encounters with both Peter Parker and Spider-Man, the first appearance of Doc Ock's arms, and the true inspiration that led him to build his remarkable appendages - which may have come from a certain web-slinging wall-crawler! It's the beginning of an amazing, superior rivalry for the ages! 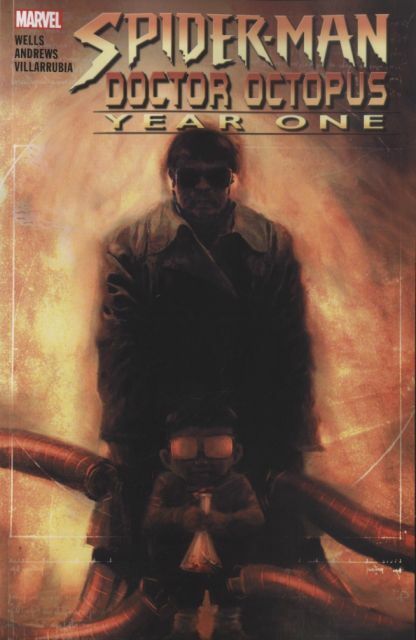 Collecting SPIDER-MAN/DOCTOR OCTOPUS: YEAR ONE #1-5.